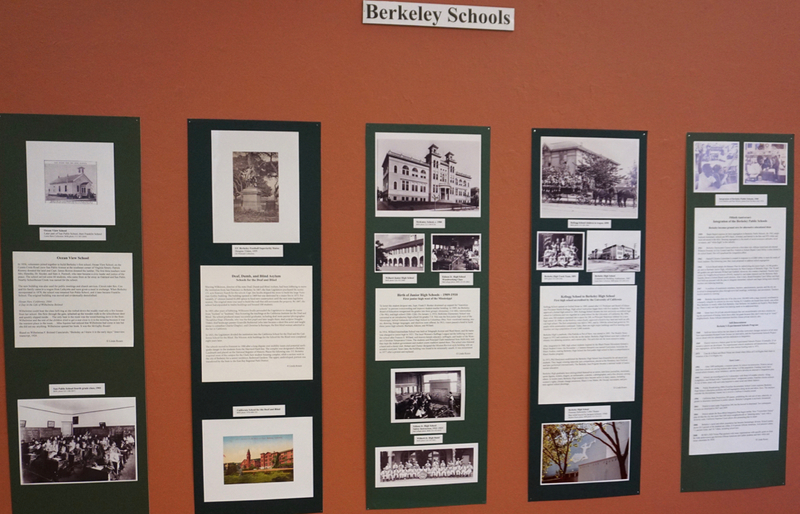 If you’re interested in a compact tour of our School District’s changes and growth over the years, you might want to visit the current exhibit at the Berkeley Historical Society. One wall is devoted to Berkeley schools, with historic photos and information highlighting significant events in the District’s development. Of particular interest – as we observe the 50th anniversary of the integration of BUSD schools – is a descriptive timeline of events leading up to the 1968 busing program and ensuing developments. The Berkeley Schools portion of the exhibit begins with a photo of Berkeley’s first school, Ocean View School, built in 1865, several years before the City of Berkeley was born in 1878 and before the five-year-old University of California relocated from its Oakland birthplace to its Berkeley home in 1873. The school, after which nearby Schoolhouse Creek is named, was located at the southeast corner of Virginia St. and Contra Costa Road (now San Pablo Ave.). It later became part of the now-closed Franklin Elementary School, which became the current home of the Berkeley Adult School. The Historical Society’s exhibition, “Collection Gems: Forty Years of Documenting Berkeley History,” is located in the Veterans Memorial Building in downtown Berkeley at 1931 Center Street. Hours are Thursday, Friday and Saturday, 1-4 p.m. The exhibition ends October 13. Exhibit wall devoted to Berkeley schools, part of the “Collection Gems: Forty Years of Documenting Berkeley History” exhibition at Berkeley Historical Society.